A probing, ultimately critical dual biography of the Boston Brahmin brothers who helped plunge America into the Vietnam quagmire as members of the JFK-LBJ —best and brightest.— Bred to esteem public service by father Harvey (an assistant to Henry Stimson in the Hoover and FDR administrations), William and McGeorge Bundy seemed natural choices when John Kennedy appointed them, respectively, assistant secretary of defense and national security adviser. In the 1950s these policy intellectuals had displayed coolness during McCarthyite witch hunts—William as staff director of the CIA’s Office of National Estimates, McGeorge as dean of Harvard’s faculty of arts and sciences. But, Bird (co-editor with Lawrence Lifschultz of Hiroshima’s Shadow, p. 543, etc.) emphasizes, these gifted, charming men also epitomized the “vital center” that was as confident of projecting liberalism abroad as it was of upholding it at home. Bird’s predilection for New Left/revisionist history inclines him to view American power as provocative toward communism during this period (e.g., he sees JFK’s management of the Cuban missile crisis as less a triumph of cool thinking than a lucky escape from the consequences of assassination plots against Fidel Castro following the Bay of Pigs). 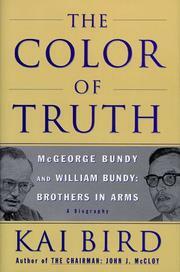 At times, the Bundys seemed less governed by the lessons of Munich than by a politically pragmatic fear of what McGeorge called “the wild men in the wings” (i.e., conservative Republicans). The Bundys, Bird reveals with the help of a wealth of declassified documents and interviews, realized the dangers of deep American involvement in Vietnam from the start. But their sense of loyalty to Lyndon Johnson caused them not only to stay silent publicly but even to mute their dissent privately with him, thereby doing a disservice to boss and country, Bird suggests. Though somewhat biased toward a leftist view of American foreign policy, this biography scrupulously and compellingly details how two pillars of the American establishment struggled, often unsuccessfully, to balance conscience against power in the nuclear age.